Prototype is this year's ultimate power fantasy. Vancouver-based Radical Entertainment has produced exactly the kind of game that gets video game watchdog groups salivating, particularly those regions in Europe where the tolerance for extreme violence in media is much lower. Bloody, ceaselessly violent and morally bankrupt, Prototype still rises above the chaos to stand tall as an amazing wish fulfillment for the adolescent male in us all. But even more than that, it's a fulfillment of what we've been searching for in our superhero-themed open world games for a very long time. Prototype's story is your typical remix of every sci-fi, government-conspiracy-amnesiac pablum you've come to expect from our lazy modern-day screenwriters. Players take on the role of one Alex Mercer, a man presumed dead until he wakes up in the morgue of a military compound located smack in the middle of Manhattan. Far from being a tourist attraction, the base is just one sign of an increased military presence on the island. See, there's a viral outbreak on the loose and it's not the swine or fowl variety. This nasty strain turns everyday citizens into foot-dragging zombies, or if you're really special, various fleshy looking muscle-bound creeps who run on all fours and have a penchant for hiding in water towers. Alex has no recollection of who he is or why he suddenly possesses super-human strength and agility, yet the predominant thought in his mind is to seek revenge on those who did him the favour. He acts as if being able to scale office towers in seconds is the worst thing that's ever happened to him. It's a necessary motivator to drive the plot perhaps, but it's not something that endears Alex to you as a hero or makes you sympathize with his emotions. After the lengthy intro sequence that sets up the story and provides you with a tutorial that teases all the powers you'll gain over the course of the game, the whole of Manhattan is open for you to explore. Main story missions are clearly marked on an overhead map and you could happily complete those in turn and be done with the game in about 10-12 hours. Of course, what open world game would be worth its salt without several dozen optional side missions thrown in to pad out the play time? While the story missions are generally thrilling and quite varied, Radical sadly ripped too many pages out of Crackdown's handbook and littered the game world with amusing exercises completely irrelevant to the story. Rooftop races, timed massacres and various other contests against the clock comprise these side affairs. By themselves they provide some fun but as a whole they seem out of place and eventually get a little boring to play. They are, however, a bit of a necessary evil. You'll want to finish a bunch of these side missions if only to reap the rewards. Measured in EP or "Evolution Points", Alex earns heaps of these for almost every action performed. EP can be used to purchase a staggering number of attribute and skill upgrades, ranging from simple strength and mobility enhancements to more complicated attack powers that require specific button presses and contextual situations. It's a vast array of powers, made all the more impressive when you consider that nearly every one of them is useful or is at least fun to perform in the middle of a crowded intersection. Which brings me to the highlight of Prototype, and that is how brilliantly the upgradeable skills, the combat system and the open world combine into a whole that singularly defines what the often used term "emergent gameplay" really means. The Manhattan of Prototype is a true playground. This is that rare game where you feel like nothing is off limits and you can do anything. Of course it's all combat-oriented, so you won't be acquiring real estate or enjoying a game of ten-pin with your virtual friends. This is an open world of destruction: "criminal life simulator" buffs may want to dust off their copies of GTA IV or Saints Row 2 because Prototype is very single-minded in its area of expertise. This game is at its best when it is assaulting the senses and continually amazing you with yet another cool new ability or random bit of mayhem that makes you exclaim, "Oh sh--t! I don't believe I just did that". So it's a bit sad when the games fails to nail down design features that would have elevated it from a merely good title into greatness. For one, the difficulty curve is not smooth. The various dips and peaks in difficulty between missions can be jarring, mitigated somewhat by the generous mid-mission checkpoint system. The mission themselves, particularly the boss fights, hamstring the player by demanding supreme application of 1 or 2 valid techniques in order to achieve victory. In a game where anything can happen during a heated battle (and often does), the boss battles do nothing but up the frustration levels and break your immersion. The final boss encounter is especially painful: it's poorly staged, anti-climactic and shamelessly punishes the player for trying to use all the skills at their disposal. There are just a couple methods to go about defeating the boss and if you need a dozen tries to figure it out, so be it. I also was not impressed with the poorly directed cutscenes and the story in general, which only served up one video game cliché after another without a hint of wit or irony. I can barely recall anything memorable about the cinematics or characters and the supposed twist revealed near the end was telegraphed far too early. A blissfully naive or inexperienced gamer you would have to be to feel surprised by anything in the story. Prototype, for better or worse, also leaves little room for a sequel, with the climax whimpering out to a hum-drum conclusion and Alex moping off into the sunset. Given the weakness of the storytelling, it's probably for the best that they don't stretch things out into a trilogy. I still highly recommend Prototype to the action-oriented set. Mechanically, it is one of most sophisticated and ambitious action romps of the year but the poor effort shown towards the deeper content such as mission design, storytelling and play balance drag down the game's score considerably. On paper at least, a 5 out of 5 would not have been out of the question for a game of this magnitude. Execution of solid ideas, however, is still the defining factor of the best games and it's clear that Prototype is an experiment that escaped from the lab just a bit too early. Nice review Clinton. I've sorta been going back and forth on pulling the trigger on this one. Gotta get through Condemned 2 first! I'm really excited about this one! A lot of my friends are working on this game at Radical and I'm sure it'll be a good one! Just need to pick up my copy. Yeah this is one game I missed that I most certainly have to pick up this summer. 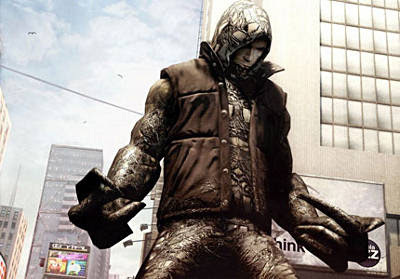 I've put in some time with inFAMOUS and it would be great to compare and contrast the two open-world adventure games. VancityAllie: that final boss had me cursing some of your friends over at Radical but overall the game was a sweet rollercoaster ride! It's a must-rent & hardly a waste of $70 if you buy. As for comparisons to inFAMOUS, I intentionally avoided any mention of it because, well, we don't need to go there again, ha! I also fear that I'd re-igniting the gamers' civil war, lol. I'd still like to hear your impressions of Prototype vs. inFAMOUS, Paul, as I've only played about 20 min. of the latter. Haha, well by the time I clear both games there won't be much point in doing a formal write-up on the site (plus it's already been overdone), but perhaps we can talk about it on a future podcast.